Mountain View Horse Farm Estate Home on 47 Acres for Sale by Owner near Asheville, Buncombe County NC. For Sale by Owner Western North Carolina mountain view horse farm near Asheville NC. NC Blue Ridge Parkway and Smoky, Smokey Mountains National Park area mountain view, lake view and lake front land for sale by owner. 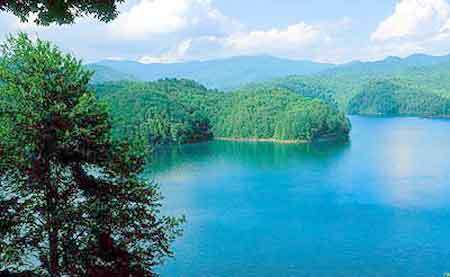 Land, acreage, acerage, acres, acers, lakeside building lots, mini farms horse pasture, water front acres, lake front log home sites, home sights, creek front investment tracts and land for sale in the NC Smoky, Smokey, Smokeys, Smokies Mountains. This 47 acre farm is set atop a 2400 ft. knoll that offers spectacular panoramic views. The property includes a main residence, a carriage house, a tobacco barn and a second residence that can be sold separately. Truly one of a kind property looking for the right person. Whether you want to run it as a farm, raise horses, operate a bed and breakfast, or just enjoy the gorgeous surroundings, this could be the place of your dreams. Click on links for more information about specific attractions. For Sale by Owner FSBO South Western North Carolina Mountain real estate near Cherokee NC and Great Smokey Mountains National Park. Lake Fontana, Santeetlah Lake NC and Asheville North Carolina acerage. For Sale by Owner real estate directory of Southwestern North Carolina real estate listings, high elevation mountain view homes, lake view lots, lake view acres, log homes, cabins, homesites, home sites, land, lots, acreage, acerage, acres, acers, creek front, waterfall, lakefront homes, lakefront lots, lake view tracts, golf course lots, vacation rental chalet, retirement homes and investment properties. For sale by owner properties in Andrews, Asheville NC, Ashville, Ashvil, Hendersonville NC, Cherokee, Murphy, Marble, Robbinsville NC, Hayesville, Brasstown, Franklin and Sparta NC. Real estate listings in Clay County, Cherokee County, Graham County, Henderson County, Swain County and Buncombe County. For sale by owner homes and lots on or close to Great Smoky Mountains National Park, Lake Nantahala, Hiawassee Lake, Lake Hiwassee, Fontana Lake, Lake Chatuge and Lake Lure, USFS, US Forest Service land, United States Forest Service, . Homes and land close to Nantahala Gorge, Nantahala Outdoor Center, Nantahala River rafting, Appalachian Trail, Apalachian Trail and the Great Smokey Mountains National Park.